The first postal stationery card was introduced in 1909. 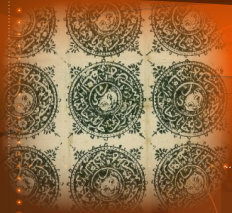 It had an imprinted 1 Shahi stamp and was printed in red brown on cream paper. In 1913, the colour was changed to brownish red on cream. 1 Shahi red brown on cream, used from Peshawar, 1331 Hamal 17 (= 27th December 1912). The reverse of an unused card, which featured a spray of roses. There are now eight known designs. All are very scarce. Issued 1913. Used from Peshawar in March 1917. These were sold at a price of 1 Sanar, double the price of a normal postal stationery card. In addition, they were not valid for postage unless a 2 paisa stamp was added. Issued 1913. This example is used from Kabul on 11 Shawal 1335, to Peshawar 23 Shawal 1335 (= 17th August 1917). The inscription at the top left of the card reads “Postcard is to be sent without an envelope–price of the postcard stamp shall be 2 Paisa”. The inscription at top right reads “Pictorial postcard, in price one Sanar, is not acceptable by the Post Office without a stamp”. In the centre it reads: Postal Card of the Supreme Divinely-appointed Government of Afghanistan.